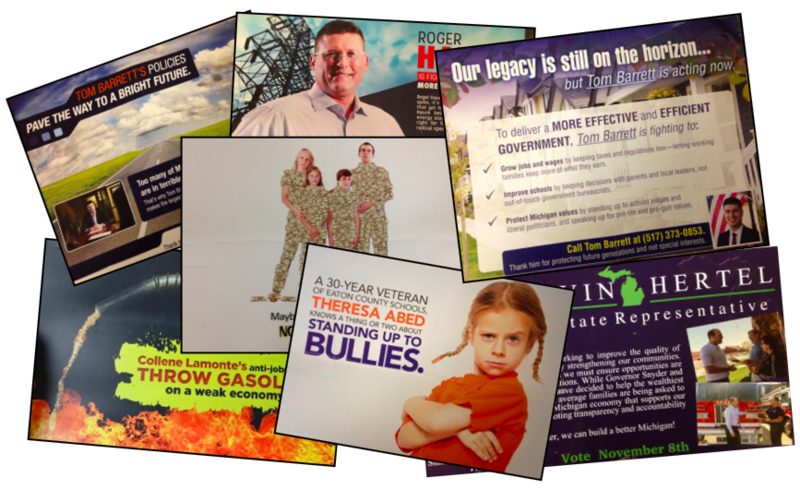 LANSING — The candidates with the most money won 91.8 percent of Michigan’s state House races this fall, according to currently available public disclosures and TV ad-tracking data. Out of 110 races for seats in the House next session, the candidates who appear to have attracted the most financial support won 101 of them. 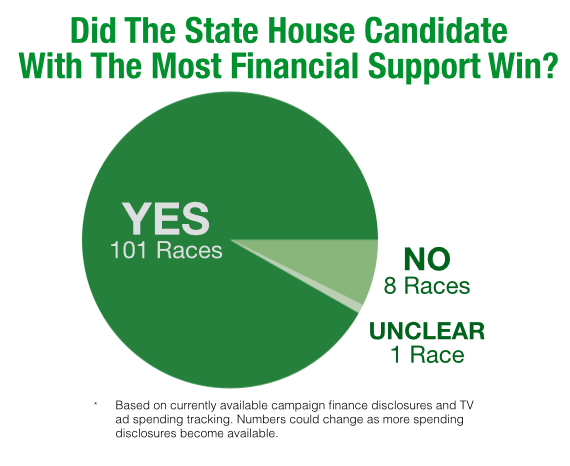 Only eight of the races appear to have gone to the candidates with less financial support. In one race, it’s still unclear because the winning candidate and the losing candidate both had reporting waivers. That winning candidate is Democrat Bettie Cook Scott, of Detroit. She’s been elected to represent the 2nd District. The numbers are based on MCFN’s analysis of comprehensive campaign finance disclosures from candidates for the cycle through Oct. 23, reports on late contributions of $500 or more through Nov. 5, independent spending disclosures for the general election through Oct. 20 and broadcast TV advertising by outside groups through Election Day. The spending totals will change and increase as additional disclosures become available in December and January. The current list of total money in the general election races is available here. It will be updated. As of now, the 109 winning candidates for which there are disclosures available averaged $133,656 in financial support, according to the data. Six of them attracted more than a half-million dollars each. It’s impossible to determine exactly what the average is for the major party losing candidates because 44 of the 110 had reporting waivers, in which they vowed not to raise more than $1,000 in exchange for not having to report their fundraising. In addition, three other losing candidates haven’t filed the disclosures they should have, according to information posted on the Secretary of State's website. Of the 10 candidates who had the most financial support for their campaigns overall, according to current data, five won and five lost. The five Republicans on the list won. The five Democrats lost. — 20th District: Democrat Colleen Pobur, of Plymouth, had about $46,501 more in financial support than Republican Jeff Noble, of Plymouth. But Noble won by 7.1 percent of the vote. — 24th District: Republican Steve Marino, of Harrison Twp., won despite Democrat Dana Camphous-Peterson, of Mt. Clemens, having a slight money advantage. Camphous-Peterson received about $209,546 in financial support while Marino received about $150,101. — 66th District: Democrat Annie Brown, of South Haven, and Republican Beth Griffin, of Paw Paw, had similar financial support. Brown was at $590,488, according to the early numbers. Griffin was at $543,000. Brown lost by 8.5 percentage points. — 99th District: Democrats invested heavily in the campaign of Bryan Mielke, of Mt. Pleasant: $719,108. But he couldn’t beat Republican Roger Hauck, of Mt. Pleasant, who had $504,944 in support. — 101st District: Former Rep. Dan Scripps, a Democrat from Fruitport, attracted $601,370 in financial backing. But he couldn’t beat Republican Curtis VanderWall, of Ludington, who garnered $488,810 — much of it coming in the form of Michigan Republican Party broadcast TV advertising. — 108th District: Republican Beau LaFave, of Iron Mountain, won the 108th with about $372,807 in financial support. Democrat Scott Celello, of Iron Mountain, lost with about $508,096 in support. In two districts, Democrats won while having less financial backing. — 23rd District: Democrat Darrin Camilleri, of Brownstown, narrowly flipped the 23rd District with about $215,480 in financial support. He beat Republican Bob Howey, of Trenton, who had $282,547 in support. — 26th District: Republican Randy LeVasseur, of Royal Oak, heavily self-funded his campaign in the 26th, according to campaign finance disclosures. He chipped in at least $48,871 of his own money for his campaign. But he couldn’t upset Democrat Jim Ellison, of Royal Oak. For comparison, in 2014, 106 of the 110 of the House seats went to the candidates who attracted the most money.